God bless YouTube. I was doing a periodic sweep of familiar search terms, and came across this video from August 21, 1998 (which was posted online a few months ago). Same Hat's cerebral godfather, at work in his studio. 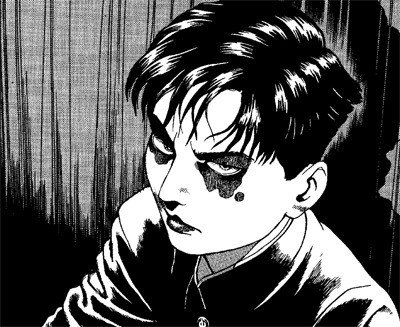 Goth Suehiro Maruo was born in 1956 in Nagasaki Prefecture. Mr. Maruo in studio being introduced. Great Video. Found it also some weeks ago. "sorta" goth? i believe you mean "super" goth. he is sporting a fake scar through his eye! @anonymous: okay okay, YOU ARE CORRECT, SIR! one of the best mangakas ever! !I have a lot of books in spanish of him! !I really love his work!! what a pity that in the states,there is only the story of comics underground japan and ultra gash inferno!! ps: did anyone read doctor inugami? ?really one of the best things that must be compared with midor,his storytelling there is amazing!!! @azraelito: yes, he's definitely more popular in Germany, France & Italy, in terms of books released. You are lucky to have Glenat. I like Dr. Inugami-- read some of the book in Japanese a while back but still haven't finished it! thank you so much for posting this...what a great shot of him, being a super goth kid! @miss nas: I know, right? @le lezard: Wait, the ORIGINAL painting? really?! oooh, very interesting. I guess I hadn't realized that those were from your own personal collection. Very, very cool! I can't thank you enough for posting this. This is wonderful.